To cause and sustain mold growth, you need an adequate moisture source, dead organic matter to breakdown, and comfortable temperatures. Unfortunately, mold is most comfortable in the same temperatures humans prefer, and all that cellulose-based building materials (wood, wallpaper, drywall, etc.) would make a delicious feast for mold. All that is missing is moisture. If your Medford Lakes, NJ property is suffering from a mold contamination, it is the consequence of an unwanted water source. You need to contact a certified mold professional to properly assess and address the mold contamination and the water source immediately to avoid further, more costly damages. Every MasterTech inspector and technician undergoes extensive training to ensure that they will be prepared to handle each unique mold case. They are fully equipped with the necessary skills, training, certifications, and tools to accurately report the findings in a compassionate and empathetic manner, while remaining honest and direct. After completing a full inspection, your MasterTech inspector will present you with a clear and concise report of findings. The report will outline what we did, what we found, where we found it and what to do next. If mold remediation is within your requirements, we will draft a scope of work for mold removal in Medford Lakes, NJ. 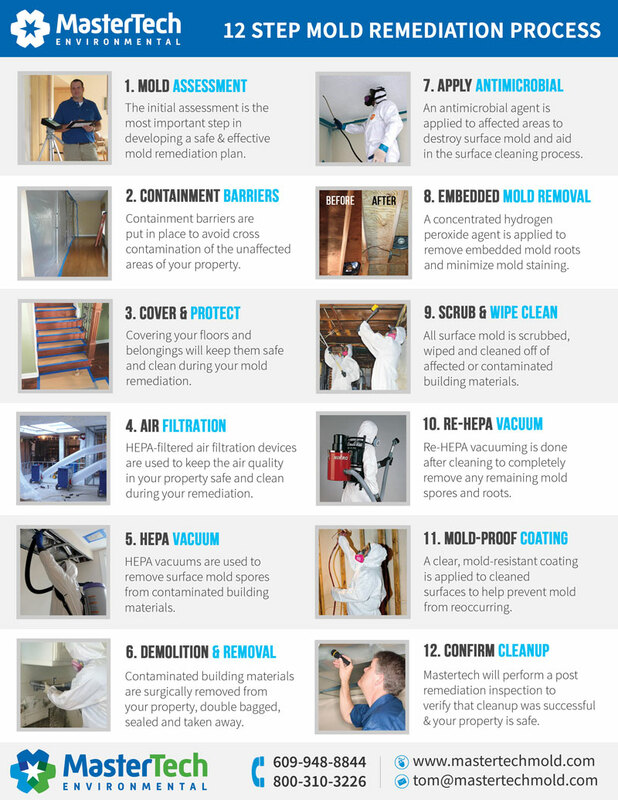 Your scope of work will be tailor-made for your specific mold removal and mold preventative needs. Identifying the source– In order to ensure the success of a mold cleanup, we must uncover and address the underlying water source that is causing and sustaining the mold growth. Our technicians fully trained to find the water source, assess the full extent of the water damage, and properly address the water source and the damage it left behind. Containing the problem– Before beginning the mold removal process, it is important that we carefully isolate and protect the unaffected areas. Our team is fully trained to set up appropriate containment barriers around all areas of concern to eliminate the risk of cross-contamination. Cleaning and disposal– In most cases, mold can be effectively removed from the surface of building materials without the use of toxic agents. However, in more severe cases of mold, some building materials may be non-salvageable. MasterTech technicians are trained in the most advanced techniques for the safe, effective, and efficient removal and disposal of non-salvageable, mold-infested building materials. For quality control purposes, MasterTech always conducts a post-remediation inspection with testing to confirm that we did the job right. You and your family’s safety and best interest will always be MasterTech’s top priority. That is why every mold remediation in Medford Lakes, NJ will come with a 5-year mold-free warranty. It is a guarantee that the mold has been properly removed, and it will not grow back. Unlike most other service industries, mold remediation done wrong can affect your family’s health and cause expensive property damage. Because of this, you’ll want to do your research to find the right mold remediation company in New Jersey with the well being of your family and home. Mold should be addressed promptly and properly to avoid further and more expensive damages. If you are searching for a trusted and certified mold remediation company, call MasterTech today to learn more about mold removal in Burlington County, NJ. For mold inspection and mold removal in Moorestown, NJ or mold inspection and mold removal in Tabernacle, NJ, call 609-948-8844. A MasterTech Team Member will gladly address all your questions and concerns and schedule you for an appointment.